Reports in the American media suggest that the Pentagon may place heavy weaponry, which could equip a contingent of 5,000 service personnel, to counter “possible Russian aggression”. Analysts in Russia believe such a step would essentially be a rejection of the main agreement regulating relations between them: the Founding Act on Mutual Relations, Cooperation and Security between NATO and the Russian Federation. A report in the New York Times (NYT) said the American Ministry of Defence has, for the first time since the end of the Cold War, offered to place heavy weapons in new the NATO member countries of Eastern Europe. Other US media organisations have also carried similar reports. The Pentagon plans to place 1200 Abrams M1-A2 tanks, Bradley APCs and self-propelled field howitzers in several Baltic states, and also in Poland, Bulgaria, Romania and possibly Hungary, the NYT reports. The Pentagon’s plan has so far not been approved by the Secretary of Defence or by the President of the US, the report clarified. 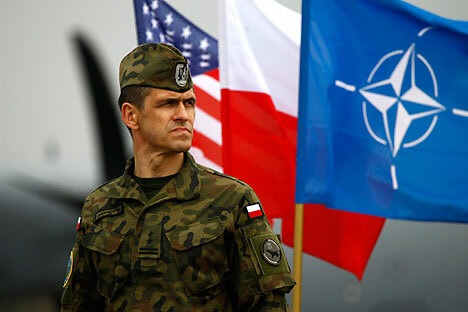 However, these approvals could happen some time in the near future, the report indicates, before the meeting of NATO ministers scheduled between June 24 and 26. Reacting to this NYT story, Kommersant reports that the Russian Ministry of Defence will consider a confirmation of this report as the first step to re-examine the Founding Act between Russia and NATO, the main document guiding relations between the two parties, signed in 1997. According to the Founding Act, the alliance (NATO) does not have the right to place substantial armed forces on a permanent basis in Eastern European countries. Which is why all NATO units in new member states are located there on a rotational basis only. The significant volume of heavy armaments makes this rotation an extremely labour-intensive and expensive operation. Analysts in Russia believe that Moscow would interpret any such actions of NATO as contrary to the Founding Act. Russia would perceive the placement of heavy weapons in Eastern Europe as a violation of the principles of the document and, possibly, as NATO’s readiness to abandon the Act. Alexei Arbatov, Head of the Centre for International Security at the Institute of World Economy said, in case the Founding Act between Russia and NATO is cancelled, only some minor agreements remain, some of which were signed during the Soviet Union era. They could hardly play any significant role in regulating relations between Moscow and NATO. However, Arbatov emphasized that the deployment of heavy weaponry and, as a consequence, the rejection of Founding Act are closely linked to the development of the situation in the Donetz Basin. The United States would place heavy weapons in Eastern Europe only if there is an exacerbation of hostilities in the east of Ukraine. There is another approach, by which the situation in Ukraine is only a pretext for NATO, which is deliberately seeking to revise the Founding Act. According to Alexey Fenenko, leading researcher at the Institute of International Security Problems, by the document’s 20th anniversary in 2017, NATO will force the Russian Federation to hold talks to amend the Act. “We will be offered to sign a new document, which will grant the consent of the Russian Federation to place troops on the territory of new members of the alliance”, Fenenko believes. Russia's response to the possible US deployment of heavy equipment could be the redeployment of troops closer to its western border and strengthening groups in the Kaliningrad region. Arbatov believes that additional military aircraft can be deployed there and in Belarus. Iskander missile systems can also be placed closer to the border. "In this sense, we will not be found wanting, we can build a group fast enough" he said. According to Fenenko, the most likely Russian reaction will be to deploy short-range missiles with nuclear warheads. The Iskander could, for example, be equipped with nuclear warheads and placed near the borders. Russian authorities have often stated this as one of their possible responses to NATO’s actions. In this situation, there are additional variables. Germany is likely to oppose placing additional NATO forces in Eastern Europe which, in its turn, will lead to protests by Poland. Arbatov observes that Germany’s position may well play a role. Germany “can effectively block any such measures, since they are not based on bilateral decisions but must take place within the NATO framework, where decisions are made by consensus. But Germany again will look at Donbass”, Arbatov said.